The Absentia series is at the very moment very classic for police-sensation production. Emily Byrne ( Stana Katic ), an FBI agent, disappears without a trace while investigating a serial killer. After six years, through an anonymous phone, she is found in a forest hut. She does not remember anything that happened when she was detained, or at least claimed. Her return home is not as joyful as she might think. Her husband Nick ( Patrick Heusinger ), also an FBI agent, has already reconciled with her death and managed to get married again. Son Flynn (Patrick McAuley), because of his young age, also does not remember her and rather treats his father’s new wife – Alice ( Cara Theobold ) – as his real mother. All in all, her brother Jack ( Neil Jackson ), a good doctor once, fought hard. In one word – the world she came back to has long forgotten about her and her sudden appearance to many is a big problem. At the same time, an investigation is underway, both by the FBI and by the cop, who was present at the discovery of Emily. Tommy Gibbs ( Angel Bonanni ) wants to solve the mystery of her disappearance. As it is easy to imagine, the FBI and the police do not cooperate successfully. Read what the producers tell us about this production! Stana Katic: I think this psychological aspect has drawn me to this story. It is not one-dimensional and simple. We have an FBI agent, an avid revenge on the man who robbed her from six years of age. For this she must fight with jealousy and despair for her lost family. Suddenly someone took her place and did not melt in the air just because Emily came back. Her husband loves another one already. Patrick Heusinger: If it were only the return show of a lost wife home, it would probably be a boring soap opera. However, we go much further. Emily came back for some reason. Someone specially held her in hiding for so many years. The fact that she was released now is not irrelevant. This puzzle is our biggest asset. Heroes along with the audience discover what’s going on. Stana Katic: This is a completely different series than Castle , with whom I’ve been involved for so many years. There every episode was a closed story. Of course there was a thread in every season, but it was just an add-on and it was changing a lot. Here we have everything run like in a full-length action movie. 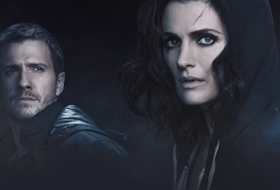 Absentia is not as funny as Castle. It has a more serious and dark tone. Absentia’s action takes place in Boston, but 100% of the shootings took place in Sofia, Bulgaria. There were a dozen or so streets that were a faithful copy of the American. They are standing on them cars and radios on the Boston registrations. As if I had slept all the way and woke up on the set, I would have no problem telling myself that we are in the USA. The scene I was supposed to watch came from the first episode. Jack, Alice and Flynn come to the cemetery to lay flowers on Emily’s grave for the anniversary of her death. They are accompanied by Adam Radford ( Ralph Ineson ), Emily’s former partner. Suddenly the gentlemen get a strange phone with the message that the woman whose tombstone is in front of their eyes has just been found in the woods. Interestingly, there were several alternative approaches to the scene where Patrick had to react more or less emotionally to the message. I do not know, of course, which version we will see on the screen, but both came out cool. As it happens on the set, it did not go without many repetitions, and it was … the cars. Now the actors had the task of driving around the cemetery, placing flowers, and then after receiving the news, quickly get to one of the cars and drive away. The key was the distance between parking the two cars, which was too many times and the vehicle the heroes had to leave, could not do it smoothly without correction. I hope you will be able to see the bloopers from these scenes someday, because Ralph’s nervousness for the fast and smooth departure was hilarious. Interesting thing. The gravestones that you can see on one of the photographs are made of polystyrene, moreover they were used in many other productions. They come from a magazine that contains only tombstones borrowed to shoot scenes in cemeteries. Not all of them have been checked to make sure each one is fictitious. There is even a special department dealing only with this issue. I also had the opportunity to see the mysterious hut in which the main character was found and perhaps she was held. According to one of the team’s representatives, the key to solving the puzzle lies in this small cottage. After seeing a few things left by the crew I guess what it is, but I will leave this knowledge to myself not to ruin your fun. Is it a serial of one season? 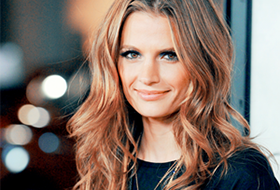 Stana states that there are opportunities to continue.